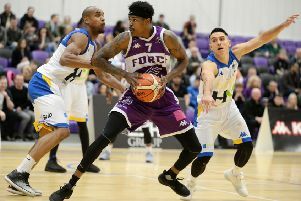 Danny Nelson sees Leeds Force’s clash with fellow BBL strugglers Manchester Giants at Trafford Sportsdome tonight (7.30pm) as the ultimate chance to begin their climb from the bottom of the league standings, writes SEB GIGNER. Without a win since beating Giants in early November, Force remain only two points and one win adrift of their cross-Pennine rivals – and Leeds play-caller Nelson was quick to affirm how important tonight’s duel could prove in sparking a much-needed change of fortunes for frustrated Force. “It’s a big game against close rivals in the league,” Nelson said. “There’s plenty of pride on the line and we’re desperate to win the series after splitting the first two games against each other this season. Force swooped to land the signatures of towering front-court duo Jack Ocwieja and Kosovo international forward Gazmend Sinani ahead of last week’s defeat against Worcester, and Nelson is confident they can make an impact in an increasingly competitive division. “Adding two new players to the fold has given us a huge boost, they’re establishing themselves well within the squad and they’ve already experienced their first game as part of the group. Nelson added: “There’s renewed energy in the team with players who are willing to fight for the Leeds Force jersey, and we’re hoping to take that energy into our fight for the win on Friday night. “It’s so much easier to coach this group of players, their commitment and effort levels has made training and practising much more efficient in the last couple of months.